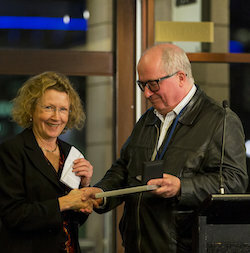 Distinguished Fellow Award - Professor Alison Booth - click here to read Professor Booth's citation. 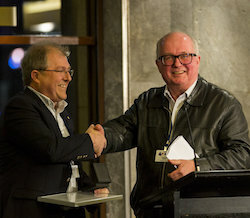 Distinguished Public Policy Fellow Award - Professor Warwick McKibbin AO - click here to read Professor McKibbin's citation. Honorary Fellow Award - Danielle Wood - click here to read Danielle Wood's citation. Congratulations to all these worthy recipients. 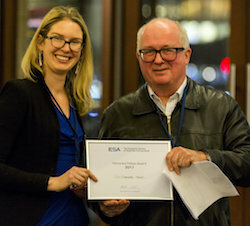 Pictured above are the award recipients (L-R Professor Alison Booth, Professor Warwick McKibbin and Danielle Wood) receiving their awards from ESA President, Matthew Butlin. Click here for more information on the Society's Awards.